The last game of the regular season had another trip to a different county to play the Mariners for the third time. The Millers had previously won 19-9 and 16-15 and for a long time it looked that the tables will turn and they would suffer only their third loss of the year. Kent started Crabb who was a fresh face for the Surrey side to see. Adam Gould manufactured the first run by legging out an infield single and showing great speed by taking advantage of an error to get to second, stealing to get to third and chancing it on a passed ball on a very short backstop. Guildford Started Gould pitching, who struck out 18 Mariners the last time in Kent. The strike zone this time wasn’t as generous but he was helped by catcher Tetsuro Shinkawa catching the Kent second baseman stealing second and aided by the defence flashing the leather. 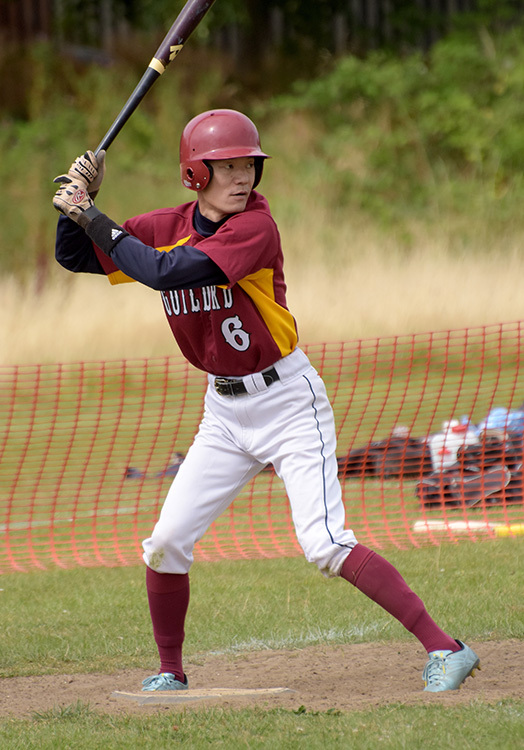 Shinkawa flashed the bat too in the second inning by batting Laura Bailes and Lewis Bawden in. Guildford just had to do what they do in training when the Mariners brought Sam Ratcliff into pitch. However, he promptly shut down the Millers bats. He impressed with a Cajun fastball and curve combo to quiet the away bench. The Mariners added more runs and ran the bases well avoiding close tags. By the end of the seventh inning they were leading 14-6. The lead had slipped to 14-9 by the top of the ninth and Kent turned to leftie Jim Blande to close the game out. Guildford dug in. Lead off batter Ben Stobart worked a walk and promptly stole second and advanced to third on an errant throw by the new catcher Ratcliff. He pushed his luck and escaped a tag at third meaning the ball went out of play for the Millers to get their first run back. Richard King took one for the team after taking a pitch on the ankle. Bailes stepped up and slapped a pitch into shallow left for Will Frawley to score. The hits didn’t stop there as Dan Reeve found his groove and knocked both King and Bailes home with a ringing double. With two outs, Gould stepped up and knocked Lewis Bawden in to tie the game. The Mariners were shell-shocked. Nine players went to bat and they did their job to tie the game 14-14, they now just had to keep the home team from scoring. Shinkawa and his curveball dominated the top of the order and buckled the home team to record only five pitches to set the team down 1,2,3. Extra innings and free baseball was in order for the first time this season. Guildford led off with Stobart again facing new pitcher Ben Saunders. It was to be a frustrating inning on the mound for him as five batters walked and Gould delivered a hammer blow by hitting a three run double. By the time that Kent recorded the third out, six runs had scored and created an advantage that the Millers would not let go of. The Mariners bats fidgeted as they dealt with ducking from Shinkawa’s curve balls and catching up to his fast ball and the game ended with a strike out with only one run having scored in the Kent tenth. Gould swung well and managed six hits and six RBIS. On the mound, he struck seven out and gave up 14 runs over seven innings. Shinkawa allowed only three base runners and one run in a sterling three innings of relief. Lewis Bawden scored four times and Bailes saved her best game for last by going 3-5 with one RBI. 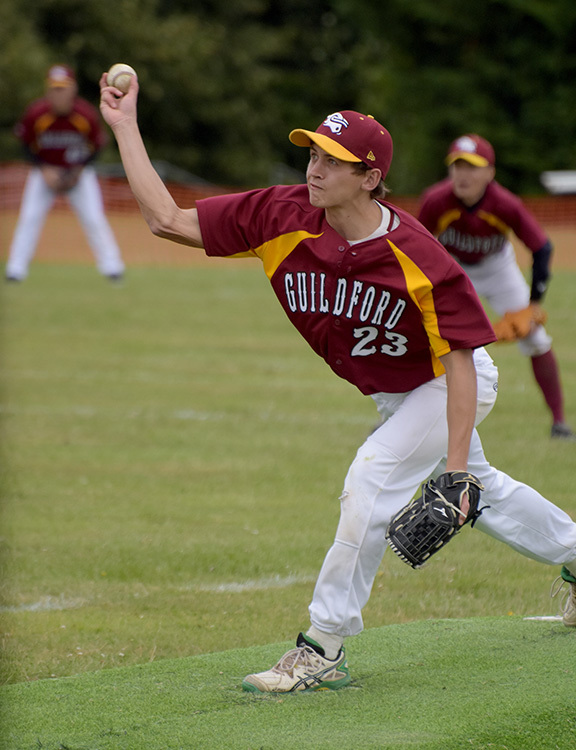 The Guildford Millers recorded an impressive 10-2 record in their first season, sweeping The Mariners, Redbacks and Squires and finishing second in Pool D. They await to see who they will face in the play-offs.